The PADI Discover Scuba Diving is a good option for those who are undecided about learning to dive as it gives you the chance to try diving. Our Discover Scuba Diving with Easy Divers Cyprus allows you to try scuba diving under close supervision of our professional Padi Dive Instructors. PADI Discover Scuba Diving is a 2 – 3 hours of what it’s like to scuba dive for first time divers’ simply a try dive. This introductory diving lesson allows you to experience the excitement and adventure, encompassing the freedom and tranquillity to breathe beneath the surface. Nothing compares to the weightlessness and exhilaration of breathing underwater. Only a diver knows that feeling! During your adventure, we will take you in a shallow bay of Protaras Cyprus, you’ll master some basic scuba concepts about scuba and scuba diving skills you be practicing, before heading off on an open water dive in the sea. You will learn about the basic scuba equipment used in scuba diving, along with very important safety guidelines and procedures during the discover scuba lesson in protaras. During your diving experience you will have the chance to passively interact with marine life in Cyprus, and observe some of the magnificent underwater colourful fish that will amaze you. Snorkelling lessons with Easy Divers Protaras? Snorkelling in Cyprus is an ideal introduction for the whole family to try out a mask and snorkel and discover the underwater world. It is inexpensive and a perfect way to keep fit and enjoy the marine life too. If you don’t have any snorkelling equipment and wish to get some advice and personal tutoring with snorkelling, Easy Divers team will be happy to help you and ang get you to the best snorkelling spots around the Cape Grecko area. Proper snorkelling training is provided by our trained staff and we highly recommend it for the youngsters and even grown-ups. Easy Divers can collect you from your hotel and take you on a snorkelling excursion in the sea most days. 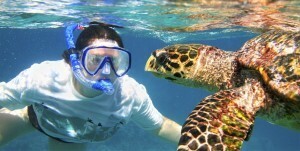 To find out more about snorkelling excursions by contacting us for more details. You can use the “Ask A Question?” or contact us. What a great way to introduce children to scuba diving in a pool in less than six feet 2 meters of water. Celebrate a birthday by throwing a memorable, exciting Bubblemaker party with friends and family, what a great part surprise to see the kid’s face light up when you tell them they are going Scuba Diving! 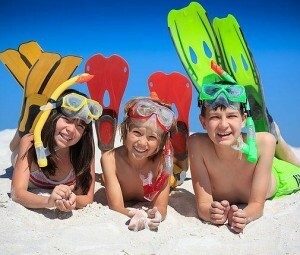 Easy Divers will arrange all the necessary equipment and transport for you and the family for a great day out. Its fun, easy and safe. Scuba diving for children is one of the fastest growing activities of the PADI Diving program. The PADI Bubble Maker course introduces basic dive concepts that are EASY and FUN for your children to enjoy. The kids get expert help from one of our PADI dive professionals. Easy Divers are able to help kids take their first breaths underwater, and discover the wonders that lay beneath the surface. The PADI Bubble Maker course can be conducted in the confines of our swimming pool which can be completed in a few hours, or in a calm and secluded bay in Green Bay, Protaras. This is your ticket to a lifetime of intense adventure with Easy Divers Cyprus, PADI dive centre that sets the highest standards in the local and global diving community. Snorkeling is a great adventure. Anyone can do it! (No minimum age requirements.) That’s The KIDS TOO! Start your action-packed adventure today – contact EASY DIVERS Today !! Find out what it’s like to breathe underwater and learn whether you can be comfortable. Learn some basic skills and safety rules that you can continue when you make a full scuba certification course when you take the next step. After you’ve a Padi Discover Scuba Diving with Easy Divers, we know you’re going to want to continue so we will count what you’ve learned on this experience towards your Open Water Certification. We will also discount the cost of the DSD from the price of the Padi Open Water Diver Course. Don’t worry – every breath you take, every move you make, we’ll be watching you! Give scuba a try when your next in protaras Cyprus. We would love to show you how to dive!